During the British Bronze Age, large megalithic monuments similar to those from the Late Neolithic continued to be constructed or modified, including such sites as Avebury, Stonehenge, Silbury Hill and Must Farm. This has been described as a time "when elaborate ceremonial practices emerged among some communities of subsistence agriculturalists of western Europe". There is no clear consensus on the date for the beginning of the Bronze Age in Great Britain and Ireland. Some sources give a date as late as 2000 BC, while others set 2200 BC as the demarcation between the Neolithic and the Bronze Age. The period from 2500 BC to 2000 BC has been called the "Late Neolithic/Early Bronze Age", in recognition of the difficulty of exactly defining this boundary. Some archaeologists recognise a British Chalcolithic when copper was used between the 25th and 22nd centuries BC, but others do not because production and use was on a small scale. 2500–2000 BC: Mount Pleasant Phase, Early Beaker culture: ; Britain: copper+tin. 2100–1900 BC: Late Beaker: knives, tanged spearheads (Bush Barrow; Overton Period). 1800–1600 BC: Fargo Phase (see correction at Bedd Branwen Period); burials. 1500–1300 BC: Acton Park Phase: palstaves, socketed spearheads; copper+tin, also lead. 1300–1200 BC: Knighton Heath Period; "rapiers." 1200–1000 BC: Early Urnfield; Wilburton-Wallington Phase. 1000–900 BC: Late Urnfield: socketed axes, palstaves (also lead). 800–700 BC: Ewart Park Phase, Llyn Fawr Phase: leaf-shaped swords. In Ireland the final Dowris phase of the Late Bronze Age appears to decline in about 600 BC, but iron metallurgy does not appear until about 550 BC. In around 2700 BC, a new pottery style arrived in Great Britain: the Beaker culture. Beaker pottery appears in the Mount Pleasant Phase (2700–2000 BC), along with flat axes and the burial practice of inhumation. People of this period were also largely responsible for building many famous prehistoric sites, such as the later phases of Stonehenge along with Seahenge. Also, the burial of dead (which until this period had usually been communal) became more individual. For example, in the Neolithic era, a large chambered cairn or long barrow was used to house the dead. The 'Early Bronze Age' saw people buried in individual barrows (also commonly known and marked on modern British Ordnance Survey maps as tumuli), or sometimes in cists covered with cairns. They were often buried with a beaker alongside the body. There has been debate amongst archaeologists as to whether the "Beaker people" were a race of people who migrated to Britain en masse from the continent, or whether a Beaker cultural "package" of goods and behaviour (which eventually spread across most of Western Europe) diffused to Britain's existing inhabitants through trade across tribal boundaries. The former seems incontestable now since a 2017 study showed a major genetic shift in late Neolithic/early Bronze Age Britain, so that more than 90% of Britain's Neolithic gene pool was replaced with the coming of a people genetically similar to the Beaker people of the lower-Rhine area. 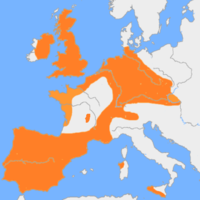 Several regions of origin have been postulated for the Beaker culture, notably the Iberian peninsula, the Netherlands and Central Europe. Part of the Beaker culture brought the skill of refining metal to Great Britain. At first they made items from copper, but from around 2150 BC smiths had discovered how to make bronze (which is much harder than copper) by mixing copper with a small amount of tin. With this discovery, the Bronze Age began in Great Britain. Over the next thousand years, bronze gradually replaced stone as the main material for tool and weapon making. The Deverel-Rimbury culture began to emerge in the second half of the 'Middle Bronze Age' (c. 1400–1100 BC) to exploit the wetter conditions. Cornwall was a major source of tin for much of western Europe and copper was extracted from sites such as the Great Orme mine in Northern Wales. Social groups appear to have been tribal but with growing complexity and hierarchies becoming apparent. There is evidence of a relatively large-scale disruption of cultural patterns which some scholars think may indicate an invasion (or at least a migration) into Southern Great Britain around the 12th century BC. This disruption was felt far beyond Britain, even beyond Europe, as most of the great Near Eastern empires collapsed (or experienced severe difficulties) and the Sea Peoples harried the entire Mediterranean basin around this time. Cremation was adopted as a burial practice, with cemeteries of urns containing cremated individuals appearing in the archaeological record. According to John T. Koch and others, the Celtic languages developed during this Late Bronze Age period in an intensely trading-networked culture called the Atlantic Bronze Age that included Britain, Ireland, France, Spain and Portugal, but this stands in contrast to the more generally accepted view that Celtic origins lie with the Hallstatt culture. ^ Adkins, Adkins and Leitch 2008. p. 64. ^ Barrett 1994. p. 05. ^ Bradley, Prehistory of Britain and Ireland, p. 183. ^ Pollard, "Construction of Prehistoric Britain", in Pollard (ed. ), Prehistoric Britain, p. 9. ^ Prior, Britain BC, p. 226. ^ Olalde, Iñigo; et al. (2017). "The Beaker Phenomenon And The Genomic Transformation Of Northwest Europe". bioRxiv 135962. ^ Tabor, Richard (2008). Cadbury Castle: The hillfort and landscapes. Stroud: The History Press. pp. 61–69. ISBN 978-0-7524-4715-5. ^ Koch, John (2009). Tartessian: Celtic from the Southwest at the Dawn of History in Acta Palaeohispanica X Palaeohispanica 9 (2009) (PDF). Palaeohispanica. pp. 339–351. ISSN 1578-5386. Retrieved 2010-05-17. ^ Renfrew, Colin (2010). Cunliffe, Barry; Koch, John T., eds. Celtic from the West: Alternative Perspectives from Archaeology, Genetics, Language and Literature. Oxbow Books and Celtic Studies Publications. p. 384. ISBN 978-1-84217-410-4. Archived from the original on 2010-06-12. Retrieved 2010-05-26. ^ Rethinking the Bronze Age and the Arrival of Indo-European in Atlantic Europe. University of Wales Centre for Advanced Welsh and Celtic Studies and Institute of Archaeology, University of Oxford. 2017. Adkins, Roy; Adkins, Lesley; Leitch, Victoria (2008). The Handbook of British Archaeology (Second ed.). London: Constable. Barrett, John C. (1994). Fragments from Antiquity: An Archaeology of Social Life in Britain, 2900-1200 BC. Oxford and Cambridge, Massachusetts: Blackwell. Bradley, Richard (2007). The Prehistory of Britain and Ireland. Cambridge: Cambridge University Press. ISBN 978-0-521-61270-8. Pearson, Michael Parker (2005). Bronze Age Britain (Revised ed.). London: B.T. Batsford. ISBN 0-7134-8849-2. Pollard, Joshua (ed.) (2008). Prehistoric Britain. Oxford: Blackwell Publishing. ISBN 978-1-4051-2546-8. Pryor, Francis (2003). Britain BC. London: Harper. ISBN 978-0-00-712693-4. Tylecote, R. F. (1987). The early history of metallurgy in Europe.